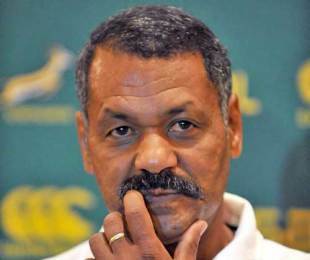 Peter De Villiers is keeping the faith with the Springboks' gameplan, refusing to alter his approach despite the make-or-break nature of Saturday's Test against the All Blacks in Hamilton. The South Africa boss has recalled Frans Steyn in place of Ruan Pienaar at fullback for a game that they must win to secure their first Tri-Nations title since 2004. In defeat to Australia last weekend De Villiers' men looked tired for the first time this season but he is confident that there will be no problems come kick-off at Waikato Stadium. "New Zealand is a very proud rugby nation and they have dominated the Tri-Nations for years," he said. "They will want badly to retain the trophy, so we expect it's going to be tough, they are going to throw everything at us. "We treat all games the same. We are ambassadors for our country and we don't want to let ourselves down or the people back home down. So all international games are like finals for us. We've tried to keep it as simple as possible. But there is a bit of horses for courses and Frans can play a major role in Hamilton with his boot. "It's not a shift in game plan. With Dan Carter at fly-half for the All Blacks we are expecting them to kick quite a bit and Frans will be able to play a key role with his big boot." De Villiers will keep tabs on both winger Bryan Habana and No.8 Pierre Spies in the build-up after they struggled with injury this week. Both have been named in the starting XV and their coach is unfazed. "The medical team has worked intensively with a few players this week and they will continue to do so between now and the game," he said. "We always said that we expected to pick up a few injuries close to the end of the Tri-Nations and it is a case of managing the players properly."